The rings of Saturn are among the more beautiful objects in our solar system. With their subtle variations they seem fragile, as if the slightest disruption would cause them to fall apart like a house of cards. In fact the rings are quite old, dating back about four billion years or more. They have evolved over time, and were likely much more extensive in the past, but they are hardly fragile. Just how disturbances can affect the rings isn’t fully understood, but we have observed some disturbances in action. One of these you can see in the image below. 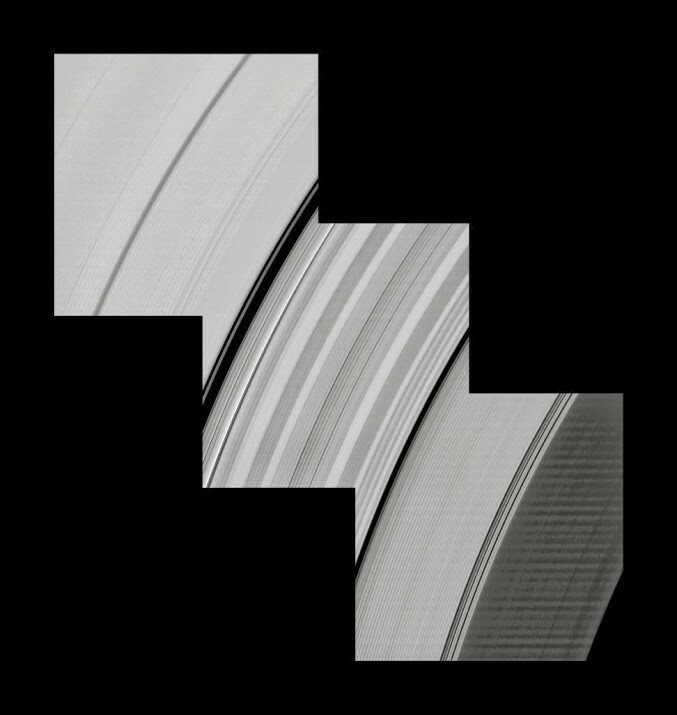 The image below shows a section of the rings of Saturn, in particular the inner portion known as the C-ring (the brighter part in the middle and upper left) and the D-ring (the dimmer part in the lower right). You might notice that in the central region there are these bands of lighter and darker regions. These variations are not caused by varying thickness within the ring, but rather by ripples in the ring itself. As the orientation of the ripples vary, the brightness of the ring varies. What’s interesting is that these variations weren’t observed by Voyager I and II when they passed Saturn in 1980 and 1981, which means something must have caused them between then and now. It must have been something pretty dramatic to cause such a large effect. So what could it be? The most obvious suspect is an asteroid or comet, but to have such an effect it would need to have struck a wide region of the rings. The observed ripples span the entire ring at that distance, so it couldn’t have been a small, local collision. A wide collision would mean that the rings would become just slightly tilted relative to Saturn. The tiny difference in orientation between Saturn and its rings would then cause a ripple to form in the ring over time. You can see how this effect would work in the animation here. While it might seem odd that a small comet or asteroid could shift the rings enough to have an effect, we’ve actually seen this happen before. In 1994 the comet Shoemaker-Levy 9 collided with Jupiter. By the time Galileo reached Jupiter, a similar spiraling pattern had formed in the faint rings of Jupiter. By modeling these ripples, it could be determined that they had started forming between June and September of 1994. The Shoemaker-Levy 9 collision occurred in July. If the same model is applied to the ripples in Saturn’s inner rings, you get a collision sometime in 1983, which confirms that it would have occurred after the Voyager missions. The collision was likely similar to Shoemaker-Levy 9, which broke apart before reaching Jupiter so that its material was extended over a wide region. A similar collision with Saturn and its rings would have caused the ripples we now observe. So rather than being a fragile thing, the rings of Saturn are an old relic with a history of collisions written upon it.